So... this happened. Yesterday was the best post day. Until recently I had no real idea what Pop! vinyl's were, or that they were such a big thing. But I've been swept up in it all and now, as I work, I've been playing YouTube videos of Pop! collections in the background. I really like seeing the things people like to collect, especially when they so clearly give them so much joy. I don't think I'll become an avid collector. Part of me would definitely love the full Harry Potter set, they look so adorable all stood together, but the other part is telling me no. Hagrid and Voldemort do look pretty great, but Dumbledore stood out the most to me, even though Hermione is one of my favourite book characters of ALL TIME. If they make Hermione in her Yule Ball dress or Luna I'll probably crack and have to have them, but for now I'm trying to be good. Less is more. And having fewer things to dust is always a good thing. Do you have any Pop! Vinyl's? I have a minion due to my obsession with anything minion, and also I have a Tinkerbell as that's my guide leader name! It's so pretty! I really want to get my paws on all of these, but Albus is my favourite too. I just love his robe. I recently bought some for my niece and nephew in an effort to avoid collecting them myself but have a way to via them. That said I'm very tempted to treat myself to one or two but I fear that I could easily get carried away! I've never heard/seen of these before but they look adorable! Oh it's so cute, and yes to Hermione in her beautiful dress! I don't have any Pop! Vinyls but they are adorable! If I started getting them I doubt I'd stop! Aww so cute! I haven't bought any of my own cause my room is horrendously cluttered and wouldn't have anywhere to put them. So cute! I had seen the ones for the Inside Out characters and I'm really tempted. I love Dumbledore quotes too so he might end up sitting on my desk! I saw some of these in Selfridges last week and didn't think much of them but the Dunbledore one that you have here is adorable! Dumbledore is definitely the best of the lot! He even seems to have a twinkle in his eye. I had a quick look at the giant wall display in Forbidden Planet and I'm still not keen on them. Not even the Jaime & Brienne GoT ones could sway me (and I could make them kiss for hours). They're so cute. Awww, Dumbledore look adorbs! Omgosh, he's amazing! I LOVE Pop! Vinyls. I don't have any Pop! Vinyls because I've been trying to resist them for so long (I'm worried if I crack and get one I'll end up with loads! 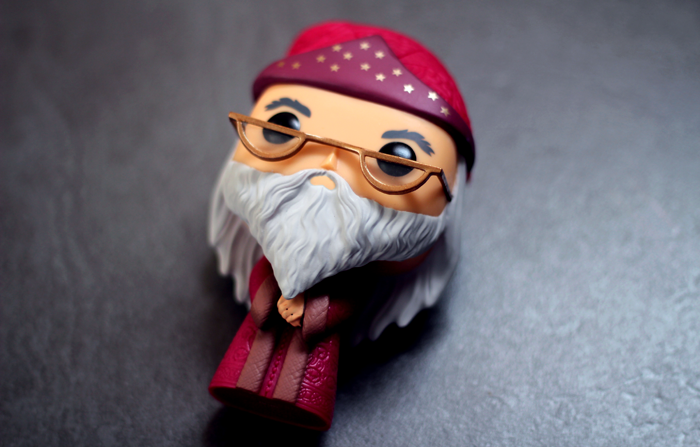 ), but this Dumbledore vinyl is amazing - I've never seen him before but I think he might actually be my favourite! Oh, my god look at Dumbly! <3 So adorable!